I love grilling tofu just with lime juice. In this dish, the sweet potato mash adds just a touch of sweetness. Delightful and easy! I had baked sweet potatoes left over but it would be just as easy to bake them an hour before making this meal. Chop up the onion and saute in safflower oil until translucent. Add corn and cook until tender. In a mixing bowl, mash up the sweet potatoes and add to the onions and corn to heat through. Heat up grill pan. Cut the tofu into triangles and squeeze the fresh lime juice onto the top side. Season with salt and pepper. Drop tofu, seasoned side down, onto the hot grill pan and cook until you see grill marks. Season the top side and flip. Cook until done. Combine all of the ingredients for the avocado puree in the processor and process until smooth. 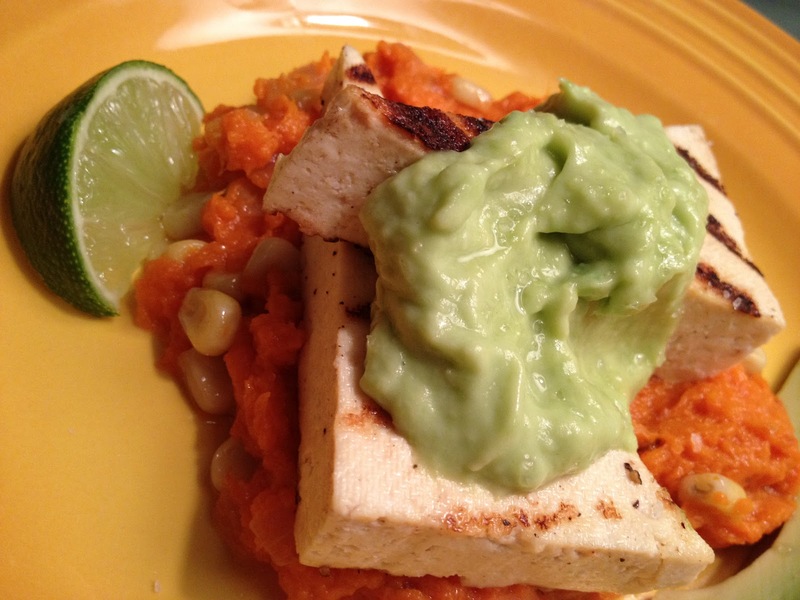 To plate, top the sweet potato mash with tofu and avocado puree. Garnish with limes and avocados. Enjoy!